Over the past few days, Texas junior Miranda Elish has accomplished a lot of firsts. First no-hitter as a Longhorn? Check. First grand slam as a Longhorn? Check. First awards as a Longhorn? Check and check. On Tuesday, Elish was honored as both the Big 12 and NFCA’s pitcher of the week. Elish was rewarded for a solid week of work that was highlighted by Friday’s no-hit effort against Iowa State. UT’s 11-0 beating of Iowa State was actually called in the fifth inning after Elish hit a grand slam. The first no-hitter of Elish’s Texas tenure was thrown four days after she lost a no-hit bid in the final inning of a 5-0 win at Lipscomb. On Sunday, Elish also threw an inning of one-hit relief against the Cyclones. 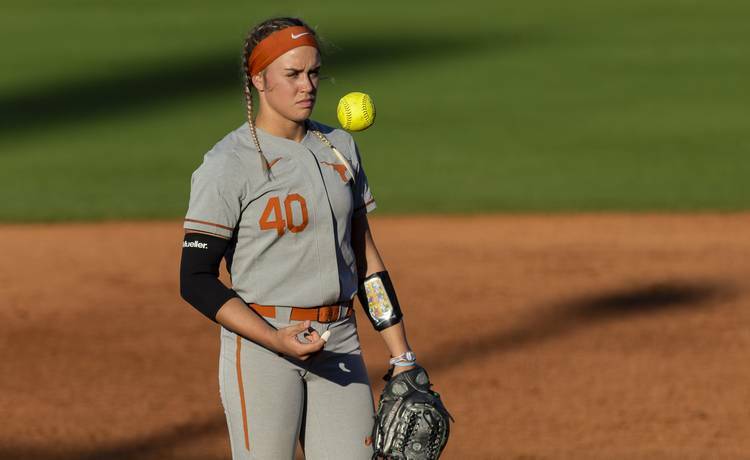 Elish, who transferred to Texas from Oregon this semester, is 8-4 with a conference-leading 117 strikeouts this season. The Big 12 honored Elish one week after Texas freshman Shea O’Leary was named the conference’s pitcher of the week. Texas was last a two-time recipient of this weekly award in 2013. Nationally, the 0.45 and 1.72 ERAs posted by O’Leary and Elish rank first and 65th. Texas (29-6; 3-0) will travel to Baylor (14-14; 1-2) on Wednesday. A three-game series in Stillwater, Okla, then awaits on the weekend’s schedule. Texas and Oklahoma State (23-9; 2-1) were ranked ninth and 21st in this week’s NFCA poll.